Tougher penalties are not an effective deterrent against handheld mobile use by drivers as many are “returning to their old ways”, new research suggests. The RAC said a number of drivers changed their behaviour in the months after the punishment for illegal mobile use was doubled in 2017, but latest figures show the habit is “rocketing among some groups”. Since March 2017, motorists caught using a handheld phone have faced incurring six points on their licence and a £200 fine – up from the previous penalty of three points and £100. 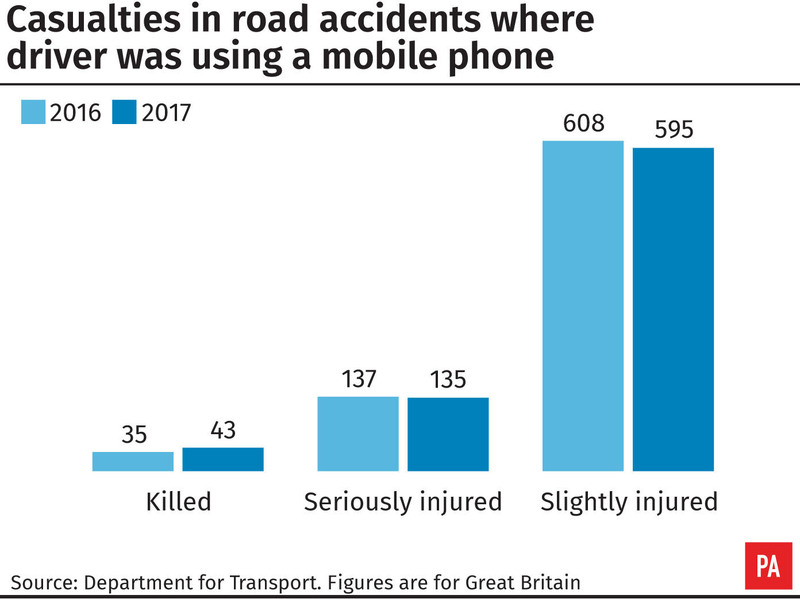 Forty-three people were killed and 135 were seriously injured in crashes on Britain’s roads in 2017 in which a driver using a mobile was a contributory factor, Department for Transport figures show. Inspector Frazer Davey, of Avon and Somerset Police, said: “The results of the survey are concerning. We know that driver distraction is a cause of collisions. “As a road policing inspector I see the impact of driver distraction and people are losing their lives as a result of the use of mobile devices by drivers.